We are accepting applications for learning awards! Students planning post-secondary stu​dies can apply for learning awards until May 15, 2019. The BVCF has released it 2018 Annual Report. ​The BVCF Grant Award Reception was held February 19, 2019. Thanks to all who attended! The Bulkley Valley Community Foundation welcomes our new Office Administrator, Deb Camenzind. Thank you to all that came and spent their time with us. Sharon Carrington, your music was a delight! Thank you to the BVCF Board for hosting the Communi-Tea! Mel Coulson, (BV Naturalists), Danielle Skerik and Jackie Wheatley, (BVCF), were on hand to celebrate the 2018 BV Naturalists Nature Diary at the Smithers Art Gallery on Friday night, Jan. 26, 2018. Congratulations to a well deserving organization. Looking for a gift for that someone who has everything? 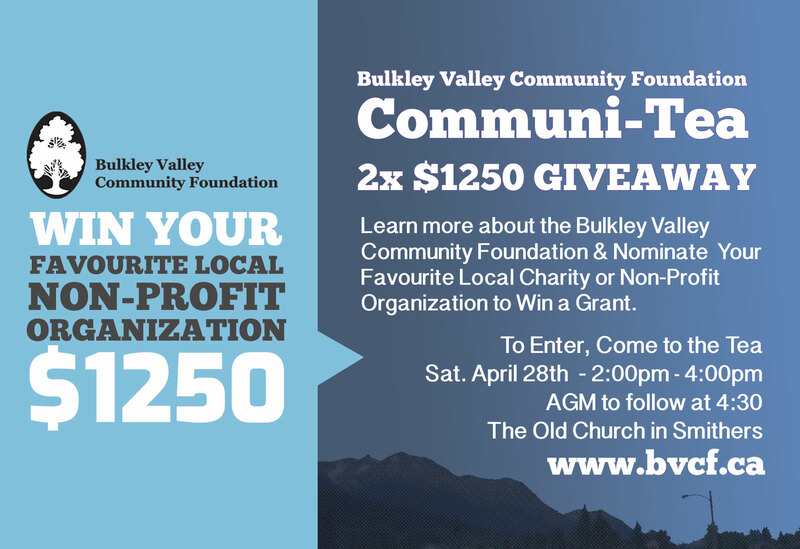 Why not give a donation to the Bulkley Valley Community Foundation in their name.